A Waterfront Dream Home on the Chincoteague Bay that sleeps 10! Aqua Vista in Captain`s Cove is a Waterfront Dream Vacation Home. Enjoy sweeping Views of Chincoteague Bay and the Canal. Relax on the Front Porch & watch Herons & Egrets - gorgeous Views of Swan Gut Tidal Creek. This fabulous Home sleeps 10 in 3 Bedrooms plus Loft & Huge Bonus Room. Soaring Ceilings, tons of Natural Light, & Incredible Views will captivate you. Enjoy Views from every room in this lovely Home. Relax and enjoy the Central AC & Satellite TV. No WiFi, but it`s available at The Marina Club, just steps away. Tons of space for your large family to enjoy all the Eastern Shore has to offer. The Dining Table expands to seat 8 with additional seating at the Breakfast Bar. The well-stocked Kitchen will delight the Chef in your family. Everything you need to make mealtime a bay breeze. Just off the Dining Area is a fabulous Sun Room with amazing Water Views. Enjoy Views even while preparing meals. Aqua Vista is so light, airy, and lovely. Dine indoors or Al Fresco on the Canal Front Deck. Windows everywhere to maximize breathtaking Views. Relax in the Sun Room and share stories of the day`s adventures. Catch some rays on the Waterfront Upper Deck. What a great place to enjoy some Fresh Local Seafood. This huge Bonus Room on the 1st floor is being converted into a Sleeping Room that will sleep 3 to 4. With a Full Futon, 2 Twin Beds, & a Flat Screen TV/DVD this will be a great Kids Room. Beatifully decorated, the Bonus Room is perfect for just hanging out, as well. A fabulous room for the kiddos. There is a convenient Half Bath just down the Hall. The 1st Floor Master has a Queen Bed and access to Waterfront Deck. Experience sweeping Water Views as soon as you wake in the morning. Luxurious Master Bath with Double Sinks. You`ll love the Spa-like Soaking Tub and Walk-in Shower in the Master. Truly like a day at the Spa. Upstairs, Bedroom 2 has a Queen , great Views, & is adorned in Beachy Blues. Aqua Vista has a fun Coastal Theme throughout. Bedroom 3 down the Hall, also has a Queen and gorgeous Views. Wake up in Paradise, and only 20 minutes to Chincoteague Island. Full Bath upstairs with Tub/Shower Combo. A very cool Sleeping Loft has another Full Futon and Work Area. Another great place for the kids to have their space and play. Of course, there`s a convenient Washer & Dryer to make life a bit easier. The Cove has incredible Amenities including 3 Pools, Golf, Tennis, and Fitness Center. Launch your boat at our Marina and keep it at the house. Plenty of room for parking - even if you bring a boat trailer. Only 20 minutes to Chincoteague Island & Assateague National Seashore. Visit our Famous Wild Ponies at Assateague - just a short drive away. Looking for the perfect Eastern Shore Vacation Destination? Look no further than stunning Aqua Vista in Captain's Cove Golf & Yacht Club - one of the best kept secrets on the Eastern Shore of Virginia. This stunning 4 Bedroom/2.5 Bath Waterfront Dream Home has something for everyone in the family. Located Canal Front on the Chincoteague Bay with incredible Views of the Bay, Canal, and Swan Gut Tidal Creek, this majestic home is a Water Lover's delight, and is only 20 short minutes by car or boat to Chincoteague & Assateague Islands, where our wild ponies roam free. Looking for some OC excitement? Ocean City, MD is a short 45 minute drive away. Have the best of everything, right in the heart of the Eastern Shore! Aqua Vista is truly a Waterfront Wonderland - Catch Fish & Crabs right in your own backyard, launch a Kayak or bring the Boat - the water is salty, sweet, and just waiting for you! This spacious Home is just perfect for 1 large family, or 2 small families to share and sleeps 10 more than comfortably. Tucked away on peaceful Starboard Street, you'll feel a million miles away from the real world - pure bliss. As you pull into the driveway, you're captivated by the Views. Situated directly on the Canal, but very close to the entrance to the Chincoteague Bay, you have expansive Water Views in almost every direction. With the front of the Home facing serene Swan Gut - a Nature Lover's Paradise, you can watch Herons, Eagles, & Egrets fish for their morning meal right from your Living Room. All of these gifts truly makes Aqua Vista a unique Vacation Experience. As you enter this Bayfront Beauty, you'll notice soaring ceilings & windows in every direction to maximize the awesome Views. 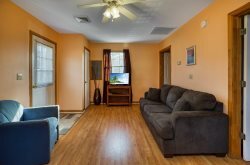 Relax in the huge Living Area with Flat Screen Satellite TV and Free WiFi after a fun-filled day at Assateague or one of the 3 Pools Captain's Cove offers. Comfortably furnished, there is plenty of room for the whole gang to be together, yet never feel crowded. The Chef in the family will love the Well-Stocked Kitchen with all you need to make mealtime super easy. There is plenty of seating in the Dining Area, plus at the Breakfast Bar. Or dine Al-Fresco on your Waterfront Deck overlooking the Bay! Don't feel like cooking on Vacation? Take a stroll to The Marina Club around the corner for some fabulous Waterfront Dining, or a 3 minute drive to the famous Crusty Crab on the Greenbackville Harbor - a favorite of Locals! Just off the Dining Area, and lining the back of the Home, is a wonderful Sunroom overlooking the Water. What a great place to curl up with a good book, or gather to share stories of the day's adventures. Aqua Vista has so many nooks & crannies to explore. The 1st Floor Master has a comfy Queen Bed and access to the Waterfront Deck directly from the bedroom. Sneak out and stargaze while everyone else slumbers - you'll love sitting outside and listening to our Tree Frogs sing. The Master Bath has a spa-like Soaking Tub, Walk-in Shower, and Double Sinks. Also on the 1st Floor is a unique Bonus Room that has been converted into another Bedroom. With a Full Futon, 2 Twin Beds, and TV/DVD, it's an awesome room for the kids. They can have their own space to relax and have fun, while Mom & Dad aren't too far away, yet can have some well-deserved grown-up time! There is also a convenient Half Bath just off of the Living Area. Upstairs, you will find 2 more Bedrooms and a Sleeping Loft! Bedrooms 2 and 3 both feature a Queen Bed and lovely Water Views. There is a Full Futon in the Sleeping Loft, as well as an Office Area if you need to get a little work done while away. A spacious Full Bath with Tub/Shower Combo is shared between these rooms. At Aqua Vista, the Outdoor Living is just as awesome. Relax on the upstairs Waterfront Deck with a cocktail, or to catch some rays. Downstairs, you'll find a Bulkheaded Boardwalk for fishing & crabbing, as well as a Fish Cleaning Station. Plenty of water to bring the boat and tie-up, as well! Captain’s Cove is loaded with amenities - a Golf Course, Indoor Pool, 2 Outdoor Pools - 1 Bayfront with Tiki Bar, Fitness Center, Playground, Restaurant, and Snack Bar. Guests may purchase Amenity Passes for the pools by the day or the week at a minimal fee ($4/pp per day or $10/pp per week). More of a beach person? One of the most gorgeous, cleanest beaches in America, Assateague Island National Park, is only 20 minutes down the street, or take your boat to one of our awesome sand bars for your own private slice of Paradise. Marina - Yes; Drop your boat in and drive it to your own back door! Great for kayak launching, also.